Many patients experience varying degrees of dental-related anxiety and fear regarding impending oral healthcare. 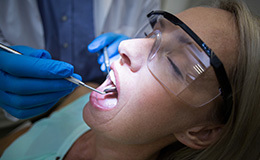 These feelings can be especially prominent when undergoing a more involved oral surgical procedure. Thankfully, Dr. Moreland works hard to promote comfort using dedicated sedative techniques. He helps each patient determine the anesthesia that best fits their personal preferences and overall level of apprehension. If you’d like to learn more about our available offerings or schedule an initial consultation, don’t hesitate to contact our St. Louis, MO oral surgery office. Our team is also always happy to accept referrals from local dentists. When undergoing local anesthetic, the patient will remain 100% conscious throughout their procedure. Typically, we recommend this method for relatively minor surgery, such as soft tissue procedures or simple tooth extractions. The anesthetic will be administered to the specific area where the surgery will be carried out. By default, our team provides local anesthetic for all oral surgery procedures. It is typically paired with other, more potent levels of sedation/anesthesia. Many patients know nitrous oxide by a different name – laughing gas! The gas is mixed with oxygen and then administered to the patient through a nasal mask. Within a few minutes of exposure, the patient should feel calmer and more content while still remaining conscious enough to respond to requests and questions from our team. It also helps with pain maintenance and relaxation. 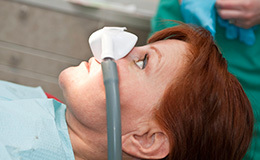 It only takes minutes to recover from nitrous oxide once the mask has been removed, which means that a patient may only need a minimal amount of downtime before being able to return to their regular routine. Our team typically recommends nitrous oxide for the removal of wisdom teeth, the placement of dental implants, and other moderate procedures. General anesthesia is a technique that literally helps a patient sleep throughout their procedure and wake up with no memory of it afterward. We offer it for all types of oral surgery, and it’s often recommended for patients who have a mild to severe amount of anxiety heading into a treatment. Many patients who are having their wisdom teeth removed or dental implants placed choose general anesthesia to ensure a smooth and pain-free experience. This technique involves the injection of a thin needle into a vein within the patient’s hand or arm. The needle is attached to an intravenous tube, and medication is delivered directly to the body in order to help patients enter a deep state of comfort. While this sedative technique does not automatically render patients unconscious, it is likely that they will still have very few memories (if any) of their procedure after recovery. Dr. Moreland is trained to administer IV sedation/anesthesia personally.